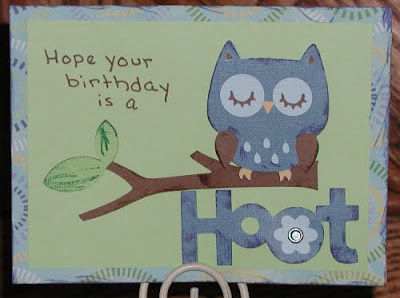 Wolf Creek Crafting: What a Hoot! Yesterday I took Shannon to her classmate's birthday party at a local campground. The kids played and swam in the pool, and the parents got to chat and catch up almost uninterrupted. Since I work from home and have very little face-to-face adult interaction, I think I had as good a time as the kids! Such an adorable card, Marcy! I'm sure the birthday girl loved it! So glad you had some catch-up & chat time!